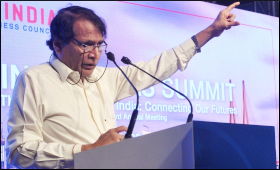 Union Minister of Commerce & Industry Suresh Prabhu on Thursday said that the new industrial policy is in sync with the challenges and opportunities for India with the fourth industrial revolution technologies and will place the country firmly in the global supply and value chains. Speaking at the launch of the Centre for the Fourth Industrial Revolution, India, by the Geneva-based World Economic Forum (WEF) in New Delhi, Prabhu said the fourth Industrial revolution is driven by digital technology and India is on track to adopt digital technology in every aspect of governance. This will help the country to leap frog into the global supply chain. Minister gave the example of the recently launched Digi yatra by the Ministry of Civil Aviation as an example of India’s vision to transform the country into a digitally empowered society. The WEF is setting up a Centre for the Fourth Industrial Revolution in Maharashtra. The other centres are in San Francisco, USA, Japan and China. Artificial intelligence, block chain and drones are the first three projects of the centre in India. WEF will work in collaboration with the NITI Aayog, business leaders, academia and start-ups in these projects.